Sunflower oil is the non-volatile oil compressed from sunflower seeds. 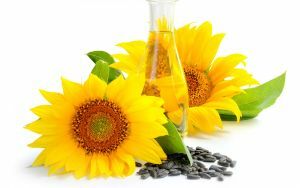 Sunflower oil is commonly used in food as a frying oil, and in cosmetic formulations as an emollient. Sunflower oil was first industrially produced in 1835 in the Russian Empire. The world's largest sunflower oil producers now are Ukraine, Russia and Argentina. Sunflower oil is a monounsaturated (MUFA)/polyunsaturated (PUFA) mixture of mostly oleic acid (omega-9)-linoleic acid (omega-6) group of oils. The oil content of the seed ranges from 22 to 36% (average, 28%): the kernel contains 45–55% oil. The expressed oil is of light amber color with a mild and pleasant flavor; refined oil is pale yellow. Refining losses are low and the oil has good keeping qualities with light tendency for flavor reversion. The oil contains appreciable quantities of vitamin E, sterols, squalene, and other aliphatic hydrocarbons, terpene and methyl ketones. Several types of sunflower oils are produced, such as high linoleic, high oleic and mid oleic. Mid-oleic sunflower oil typically has at least 69% oleic acid. High oleic sunflower oil has at least 82% oleic acid. Variation in unsaturated fatty acids profile is strongly influenced by both genetics and climate. In the last decade, high stearic sunflower lines have been developed in Spain to avoid the use of partially hydrogenated vegetable oils in the food industry. The phosphatides (0.1–0.2%) present in the oil are lecithin (38.5%) and cephalin (61.5%); they occur in combination with protein and carbohydrates. Sunflower oil also contains lecithin, tocopherols, carotenoids and waxes. Sunflower oil's properties are typical of a vegetable triglyceride oil. Sunflower oil is produced from oil type sunflower seeds. Sunflower oil is light in taste and appearance and has a high vitamin E content. It is a combination of monounsaturated and polyunsaturated fats with low saturated fat levels. Improve Heart Health: Sunflower oil can lower cardiovascular diseases and the chance of heart attack. Natural Energy: Sunflower oil provides lots of natural energy. By incorporating a little sunflower oil in your salad at lunch, you can feel naturally energized at work or at school. Lower Risk of Infant Infection: It lowers risk of infections of low birth weight and pre-term infants. These infants are at risk of infection because of undeveloped organs and skin. It serves as a protective barrier. Stops Free Radicals: Another great benefit is that it neutralizes cancer causing free radicals. This is possible because of the vitamin E or tocopherols found in sunflower oil. Free radicals damage cells as well as your immune system. Natural Antioxidant: Sunflower oil also acts as an antioxidant because of the levels of vitamin E.
Natural Moisturizer: The vitamin E in sunflower oil is a moisturizer and helps cells retain water. Prevents Arthritis: If you have worries about arthritis, then sunflower oil might be the answer to your problems. Sunflower oil helps prevent rheumatoid arthritis. Prevents Asthma and Colon Cancer: In addition to preventing rheumatoid arthritis, sunflower oil also prevents asthma and colon cancer. By adding this oil to your diet regularly you will help prevent the potentially devastating effects of colon cancer. Promotes a Healthy Nervous System: Sunflower oil contains vitamin B which is good for a healthy nervous system, good digestion, and it is great for producing energy. Lowers Cholesterol: Lecithin is also present in sunflower oil which helps keep cholesterol levels low. This is possible because lecithin sticks to your nerve and cell linings and prevents fat and cholesterol from sticking to the cell. Prevents Other Cancers: Carotenoids can be found in this oil which help prevent cancers such as uterine, lung and skin. Also, carotenoids can aid in preventing cataracts as well as provide a nice source of vitamin A. Reduces Cardiac Problems: Sunflower oil is a good way to incorporate selenium into your diet. By having higher levels of selenium in your blood, you reduce the risk of lung and skin cancers. It also reduces the chances of cardiac problems and hepatic degradation. Repairs the Body: Protein is beneficial in building and repairing tissues and the production of hormones and enzymes. Protein is also found in sunflower oil. Your body actually needs high amounts of protein because the body does not store it. Because of this, there is no backup supply of protein ready for your body to use if you do not continuously consume it. Maintains Healthy Immune System: Another benefit of sunflower oil is that it contains zinc. Zinc is great because it helps maintain a healthy immune system which helps in the healing of wounds. Zinc also is beneficial in maintaining your sense of smell and taste. Helps Create New Cells: Sunflower oil contains folic acid, which helps the body manufacture new cells.